This is the all in one migrating Tutorial / How To if you plan moving to ownCloud. You are right here, if you are currently using Google Contacts and Google Calendar, or their Apple/Yahoo pendants and would like to take them under your control using ownCloud. Head to http://owncloud.org/install/ and choose your download and follow the instructions. 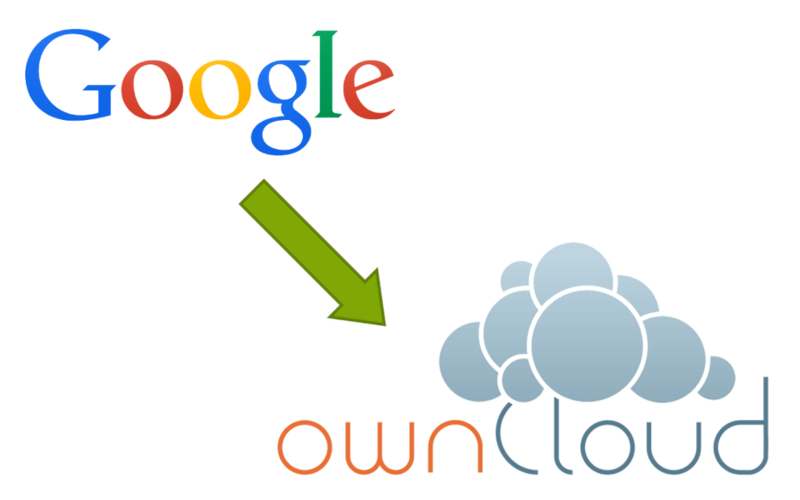 Check out this tutorial if you’re planning to install Owncloud on a Root Server or vServer. Sure, ownCloud is a cloud storage solution, but you wouldn’t be here if you do not plan to use more of their awesome features – like the Contacts app. Exporting the Google contacts is quite easy but can get you some head ache when done wrongly: Head to the website https://www.google.com/contacts/ and click More > Export. The important point is, to chose vCard format as your export format. Define the groups you would like to export and click the blue button. Go to the contacts page of your installation and click on the gear icon at the bottom left. Below Import choose the option Gmail vCard, click the upload button and navigate to your just exported vCard-file. So now we have our contacts online…well that doesn’t use much, so let’s get them running on our others devices. Now we need the cardDAV URL from your ownCloud installation. Therefore click at the gear icon (bottom left) in the contacts Tab, and then on the link icon next to your current contact List (3rd Icon). Copy this link to your clipboard. Open Thunderbird and go to your Adress Book by pressing Strg+Shift+B and select File > New > Remote Adress Book which opens a dialog. Paste in your cardDAV URL, give the contact list a name and check periodic sync if you want this (btw, for me the initial sync only worked with this option checked!). The Setup is easy and similar to the one in Thunderbird, just insert the cardDAV Url of your ownCloud contact list you wish to sync, add your login credentials and that’s it. Notice: By default two-way-sync is disabled, which means changes on your phones contact are not pushed to your owncloud server (or thunderbird). If you wish that, just enable the option. Before doing so it may be recommended to delete youre current contact storage:Settings>Apps>Contacts & Contacts Storage and ‚Delete Data‘ in both apps. So let’s move forward to getting your calendar up and synchronizing. One of the features I like on GNOME 3 is how the calendar of Evolution is integrated. It gives you a fast overview over your next appointments. To do so, grab your calDAV URL and use it in the dialog you get by Right Click > New Calendar > (type) CalDAV. The installation routine is just the same as described above for the Plugin SOGO. Now switch to the calendar tab, by clicking the new icon at the top right and make a Right Click in the left handed calendar list. Select New Calender > On the network and provide your calDAV URL and the login credentials. It costs some Euros, but that’s probably worth it, since I think there is no other simple way to get your calendar synced. After your installation, just insert your calDAV Url and credentials and everything should be fine. Actually there isn’t much to tell about the Desktop client – it is avaiable for Linux, Mac and Windows. It is able to sync ANY local folder you want to ANY folder on your server. This is something Drive, Dropbox and Co are missing in my eyes! (I guess MEGA Sync supports this aswell).